Spades is a trick-taking card game devised in the United States in the 1930s. It can be played as either a partnership or solo/"cutthroat" game. The object is to take at least the number of tricks (also known as "books") that were bid before play of the hand began. Spades is a descendant of the Whist family of card games, which also includes Bridge, Hearts, and Oh Hell. Its major difference as compared to other Whist variants is that, instead of trump being decided by the highest bidder or at random, the Spade suit always trumps, hence the name. The first team that bids has an option to counter bid their opponent. Each player bids the number of tricks he expects to take. The player to the left of the dealer starts the bidding, and bidding continues in a clockwise direction, ending with the dealer. As Spades are always trump, no trump suit is named during bidding as with some other variants. A bid of "zero" is called "nil"; players must bid at least one if they don't want to bid "nil" (see below). In partnership Spades, the standard rule is that the bids by the two members of each partnership are added together. Two very common variants of bidding are for a player or partnership to bid "blind", without having looked at their cards, or to bid "nil", stating that they will not take a single trick during play of the hand. These bids give the partnership a bonus if the players exactly meet their bid, but penalizes them if the players takes more or fewer. A combined bid of 2 "blind nil" is usually allowed, and is worth both the blind and nil bonuses or penalties. In some variants, the player bidding nil passes 1 or 2 of his cards (depending on the variant rules) to his partner and the partner passes an equal number of his cards back in what is considered "nil passing". Nil passing may be allowed only in the case of a blind nil. Each hand consists of a number of tricks (the 4-handed game contains 13 tricks using all 52 cards). The player on the dealer's left makes the opening lead by playing a single card of their choice. Players in clockwise fashion then play cards of their choice; they must follow suit if they can; otherwise they may play any card, including a trump Spade. Once a card has left the hand of a player, it stands and cannot be retrieved unless the player who threw the card makes an effort to correct his mistake before the next player lays down a card. The trick is won or taken by the player who played the highest card of the led suit – or if trumps were played, the highest trump card wins. The player who wins the trick gathers the cards up into a face-down arrangement that allows players to count the number of tricks taken. The contents of each trick can not be viewed after this point, except to determine whether a player reneged (played an off-suit card including trumps when he could have and thus should have followed suit). The number of tricks a player has won cannot be disguised; if asked, each player must count out his tricks until everyone has agreed on the "trick count". The player who wins any given trick leads the next. Play continues until all players have exhausted their hands, which should occur on the same (last) trick. Otherwise, it is a misdeal. A partnership reneges on their contract if they violate the rules of play; most often this happens when a player plays off-suit when he could have, and therefore should have, followed suit. The penalty for reneging varies; in most cases it nullifies that team's contract (the team cannot make its contract, and its score is reduced by 10 points for each bid trick), while sometimes reneging results in a three-trick penalty, meaning the team may still make contract but must take three additional tricks to do so. It does not matter if the player reneged on purpose. The bags still count against the opposing team, and will go against their points. On the other hand, if a team calls renege and that team cannot prove or call out the first hand that was a potential renege, then the team that called out the false accusation is penalized the three-trick penalty. The tricks do not count towards the opponents' bids. A common play among more experienced or skilled players is for a player who realizes that he cannot help but win all remaining tricks to simply lay down his hand and declare "the rest are mine" or similar. This is known as "TRAMing", and can help speed play of the game. An obvious situation in which a player could "TRAM" is if, with three tricks left to play, the leading player holds the A♠ K♠ Q♠. No matter which card he plays, no other player will be able to beat that card (as the player holds the only cards that can), and the same will be true for the next two tricks. Usually, situations in which TRAMing is appropriate are less clear-cut, and involve keeping track of the cards that have been played to determine whether any player could beat a particular card. A player who TRAMs when it is possible for another player to win at least one trick is penalized either by having to play the remainder of the hand with his cards exposed, by forfeiting all remaining tricks (at the discretion of the player who would otherwise take the trick, to prevent intentional false TRAMing that would give the player an advantage), or by forfeiting his bid (the hand will be scored as if that player failed to make his bid regardless of the number of tricks he takes). It is always acceptable for players to play the remainder of tricks normally, even if they are positive they will take all remaining tricks. Each player's or team's trick count is then compared to their contract. If the player or team made at least the number of tricks bid, 10 points for each bid trick are awarded (a bid of 5 would earn 50 points if made). If a team did not make its contract, it was "set" and 10 points for each bid trick are deducted from the team's score (e.g. : six bid and any number less than six taken results in minus 60 points). If a Nil bid is set, most tournament rules dictate that the overtricks make the nil invalid. A common scoring variant is designed to penalize players for underestimating the number of tricks they will take, while at the same time not removing the possible strategy of intentionally taking overtricks, or "bags", in order to "set" the other team. This is accomplished by keeping track of bags in the ones place on the scorecard, and assessing a 100-point penalty when 10 bags are accumulated and the ones place rolls over. In shorter variants of the game, where players play to 250 points (instead of the standard 500 points), sandbag penalties can be assessed earlier. In these variants, a 50-point penalty would be assessed when 5 bags are accumulated. The most common condition is the first to reach 500 points, or forcing the opposing team to drop to −200 points. 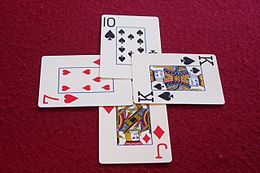 Alternatively, the game could be played for a fixed number of hands or a fixed time limit; with four players, eight hands can generally be played in about an hour. If there is a tie, then all players participate in one more round of play until a winner is decided. In games with players where the cards cannot be dealt evenly, there is a variation in which no cards are removed from the deck, but instead a kitty composed of the leftover cards (or one trick's worth of cards plus the leftovers) is placed at center. Whoever is dealt the 2♣, or alternatively, the player with the highest bid (tie-breaker being first to make that bid), picks up the kitty before bidding begins, integrates it into his hand and then discards the same number of cards. If a round of cards in addition to the leftovers is placed in the kitty, the discard by the player who picked up the kitty counts as a trick. This introduces more uncertainty in bids because usually the person with the kitty tries to void one suit and trump earlier in the game. Passing, or the exchanging of cards between players, is optional and rare in Spades. However, one more common exception relates to Nil bids, which are generally considered difficult to make, especially when the bid was blindly made. To offset this difficulty slightly, a partnership in which one player has bid Nil or Blind Nil can choose to pass two cards between players; the most common arrangement is one card for regular nil and two cards for blind nil. When passing, the partners agree on a number of cards to pass, then select that number of cards and place them face down in front of their partner. Neither partner should look at the cards passed to them before they have passed their own cards. In passing this way, the idea is for the partner who bid Nil to offload their highest trumps or other face cards in return for low cards from their partner, which both decreases the likelihood that the nil bidder can be forced to take a trick, and increases the likelihood that his partner will be able to "cover", or overplay high cards the nil bidder still holds that would otherwise take a trick. The number of cards passed should be determined before the game begins so that each team can use this as they bid. Passing does not have to be limited to this one case; players may agree that a certain number of cards may, or must, be passed either between partners or to the opponent on each player's left or right, before or after making a bid. Passing between opponents is borrowed from Hearts and generally allows players to attempt to "shorten" or "void" a suit, or get rid of "dangerous" cards such as upper pip cards or low face cards, which may win a trick the player didn't bid to take. Passing between partners in situations other than Nil bids is rare, as the players would have little or no information about cards their partner would want or that opponents wouldn't. Each team is required to make a minimum required bid of four tricks. When bidding Nil, the player's teammates must bid a minimum of four tricks or bid Double Nil or Triple Nil with three teammates. When playing solo, one can bid Nil or board. You can never bid anything between Nil or board. A variation to this play involves setting the minimum bid to whatever number the players agree on. The only exception to this rule is the Ace Check rule. If a player holds three or more Aces in his hand, that player may use the phrase Ace Check during the bidding round. The partner then discloses whether or not they have an Ace. If the initiating partner can now determine that all four Aces are held within the partnership, he or she may pass a card face down to his or her partner. Doing so creates a special contract where if the partnership retains all 4 Aces after all cards are played for the hand, they receive a 100-point bonus. If not, they receive a 100-point penalty. The Ace Check variant is optional to Partnership Bidding, and is generally only used in combination with "Deuces High" or similar Trump Variants where the Ace of Spades is more difficult to retain since other cards in the deck are assigned a higher rank. Variation of bonus where bonuses are split into two between 4 players (8 + 3 and 10 + 3). This variation is played widely in India and England. This must be declared by a side before either partner looks at their cards. It scores 120 points if the side takes exactly six tricks. If they take some other number of tricks they lose 120. It is also commonly played that the side must win at least six tricks and overtricks are not counted, or that failing to make six tricks only loses 60. In this variation, the first partner of a team to bid may, if he chooses, bid tricks in increment of one-half instead of one, i.e. "I bid three-and-one-half". His partner is then required to bid such that the team bid rounds out to a whole number, i.e. "I'll bid two-and-one-half" for a team bid of six tricks. This gives some information between partners; a player is bidding that they will take three tricks and might take a fourth. Their partner can then use this in determining the other half of the partnership's bid. 3 teams of 2 players play with 2 decks minus both 2♥. The 2♦ is the highest spade followed by the 2♣ and Ace♠. They must follow the spades suit rules. If identical cards are played in a round, they cancel and cannot take the trick. Tricks won by no one are "dead" and discarded. Successful nil bids score 50. Double nil scores 200. No blind bid bonuses. Missed bids cost 10 points for each trick short—getting 3 of 5 means −20 points. Tricks taken by a nil do not count towards a non-nil bid and are penalized 10 points each. Extra tricks get 1 point—no penalties for sandbags. Game is six hands with each player dealing once. Optionally, 8 players can share two full decks with nils worth 30 and double nils worth 100. Conversely, against a computer program where the object is for a human to beat the computer software, being saddled with a weak computer partner does not provide a satisfying game. Thus, Cutthroat makes more sense for a computer game than Partners. Cut or cutting - In Spades, when a suit being played gets cut by a spade and thus takes the book unless the following player trumps theirs with a higher spade. Also, when a partner trumps the other partners winning card, for example the first partner threw out a king of diamonds and his partner then trumped it with the ace of diamonds. There are times when this can be a strategic move, though not often. Slough (Sluff) - ( also known as "throwing off"),to play a card that is not a trump card but of different suit than the first suit played, therefore discarding that card. Sloughing is normally used to get rid of a card that may otherwise take a trick the player does not wish to take. It can also be used to void other suits allowing play of trump cards in tricks where that suit is led. Three Amigos - The Ace♠, King♠, and Queen♠ of spades. When a person has all three it usually mentioned when they are being led out in order. Also, with the Jack♠, "the three amigos and their little brother". ^ Barry Rigal (2011-03-04). Card Games For Dummies. Google Books. Books.google.com. ISBN 9781118054765. Retrieved 2012-12-10. ^ The Complete Win at Spades: Basic, Intermediate, and Advanced Strategies and ... - Joseph D. Andrews - Google Books. Books.google.com. 2000. ISBN 9781566251457. Retrieved 2012-12-10. ^ a b c d e f g h i j "Spades rules on". Pagat.com. 2018-03-17. Retrieved 2018-09-11. ^ a b c d "Spades rules on". Rubl.com. Retrieved 2018-09-11. ^ a b c d e f g "Spadeology Spades site". Archived from the original on 2016-10-20. Retrieved 2018-09-10. ^ "Spades - Complete Card Game Rules". Boardgames.about.com. 2014-05-30. Retrieved 2014-06-12. ^ "Spades - card game rules". Pagat.com. 2013-11-15. Retrieved 2014-06-12. ^ "Internet Spades scoring system has changed for the worse - Microsoft Community". Answers.microsoft.com. Retrieved 2014-06-12. ^ "Internet Spades: how to play". Windows.microsoft.com. Retrieved 2014-06-12. ^ AACSA (2005-12-17). "AACSA Tournament Rules - Spades". Sjaacsa.org. Retrieved 2014-06-12. ^ "Case's Ladder". Grandprixtournaments.com. 2014-03-26. Archived from the original on 2013-12-25. Retrieved 2014-06-12. ^ "Spades Rules | Hoyle Card Games | Official Site". Hoylegaming.com. Retrieved 2014-06-12. ^ Arneson, Erik. "Spades - Card Game Rules - About.com". Boardgames.about.com. Retrieved 2018-09-11. ^ "Spades Card Game - Variations". www.spadesgame.net. Retrieved 2016-07-12. ^ a b "3B-Spades rules". Facebook.com. Retrieved 2018-09-11. Play Multiplayer Spades Online with 3-7 players on any variation hassle free (without ads, flash, download or signup).